Do not grow crops for energy instead of food. That is the message of a new report from the World Resources Institute (WRI), which claims that dedicating crops to generating bioenergy is too inefficient to solve energy crises and makes it harder to sustainably feed the planet. "Bioenergy is an inefficient use of land," reads the report. "Because every time we dedicate land to bioenergy, we sacrifice the opportunity to use that land for some other human need, ranging from food to carbon storage." The world already faces agricultural pressures, as a growing population will require 70% more food by 2050. And meeting bio-energy targets — such as providing 20% percent of the world's total energy demand by 2050 — whilst feeding nine billion people would require humanity to at least double the world's annual crop production. The WRI points to solar PV as an efficient technology that can deliver the sustainable results that bioenergy reportedly cannot. Even fast growing crops only convert around 0.2% of solar radiation into ethanol, while solar PV is exponentially more efficient, the report says. "On three-quarters of the world's land, PV systems today can generate more than 100 times the useable energy per hectare than bioenergy is likely to produce in the future even using optimistic assumptions. "And unlike bioenergy, solar energy works great in deserts and on rooftops without competing for fertile land." Responding to the argument that solar — unlike biofuels — cannot be used as transport fuel, the WRI claims the efficiency of electric motors allows solar PV to generate 200 to 300 times as much energy per hectare for vehicle transport. 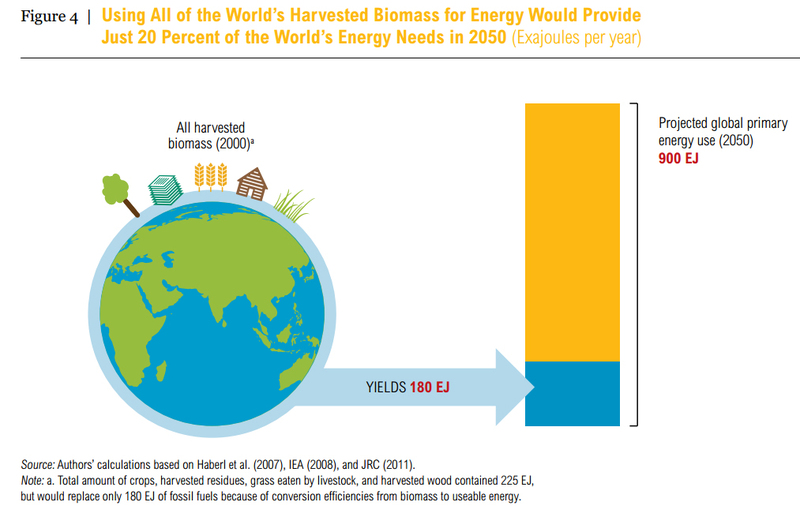 Bioenergy, by contrast, is so 'inefficient' that burning the entirety of the world's crops would fulfil just 20% of the world's energy needs in 2050. The WRI report comes just one week after the director-general of the UN Food and Agriculture Organization threw his weight behind biofuels. Speaking at the Global Forum for Food and Agriculture, Graziano da Silva said: "It is important not to forget that biofuels emerged with strength as an alternative energy source because of the need to mitigate fossil fuel production and greenhouse gases - and that need has not changed. "We need to move from the food versus fuel debate to a food and fuel debate...biofuels should not be simply seen as a threat or as a magical solution"
Da Silva's comments were reinforced by a University of Utrecht study which found that the risk of inefficient land-use can be mitigated and even prevented when biofuels are produced from high-yield crops on currently under-utilised land. The study calls on policymakers to incentivize the use of these types of biofuels within EU biofuels policy.